Do fever blisters hurt? Depending on the stage your sores are in, they can be very painful. There are two types of fever blister pain common among blister sufferers: physical and emotional. Physical - Anyone who has ever had a fever blister has experienced some degree of physical pain because of it. Multiply the pain if many eruptions occur at one time. Emotional - Breakouts around the mouth are hard to hide and can be embarrassing. 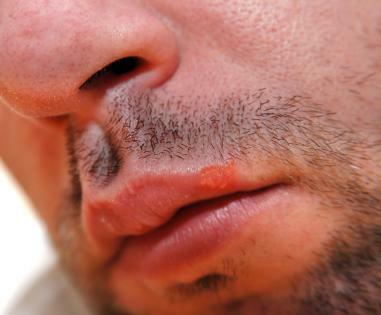 The proper name for fever blisters, "Herpes Simplex Virus," is also discomforting because of the mistaken association between this virus and the venereal type. Do fever blisters hurt? Fever blisters and they pain associated with them may last for days, or even longer. During different stages, the type of blister pain and the pain intensity changes. Stage 1: A burning, tingling or itching sensation occurs around the nose or mouth. The area will become red and sore. Pain is minimal in this stage. Stage 2: Blisters will rise in the area that previously suffered the irritation. This will take a day or two. Soreness will continue as the blister sacs fill with fluid. The pain is building and the blisters are painful. Stage 3: Blisters will burst or ooze. This is the weeping stage. After the blister erupts, the raw exposed skin will burn. This usually lasts two to three days. It is the most painful of all the stages and your fever blister will feel like an open wound. Stage 4: Busted eruptions will begin to scab over and show a discolored crust around the sore. Most of the pain experienced in this stage is due to the skin tightening as it scabs. Keeping the blister lubricated during this stage will cut down on the pain. Pain begins to diminish during this stage. Stage 5: Scabs will fall off and new ones will appear. Each time a new scab replaces an old scab, the scab and the remaining wound becomes smaller. This is the least painful of the stages. The short answer to this question is "yes!" Luckily, advances in fever blister medication and fever blister home remedies have given blister sufferers some relief. If you detect a blister during stage 1, there are medications you can use to diminish the outbreak. Keep the area lubricated and wash your hands after treating the sores. Avoid salty, acidic foods, which can make the pain worse. Fever blisters are painful but they only last for a short period of time. With the proper care, you can diminish your discomfort and speed the healing process.